Motorpoint’s Ian Bibby has said that he will do the best he can at the Tour of Britain in a bid to land his dream move to a bigger team. When asked by Cycling Weekly about next season at Sunday’s London-Surrey Cycle Classic, Premier Calendar leader Bibby said: “I’ll just have to see how the Tour of Britain goes. I’ll do my best and I’ll be going for it. He was understated in talking about Motorpoint’s preparations for the event, suggesting that the light racing schedule the team has had might be a potential problem in preparing. “We’ve not done too much racing to be honest, but we’ve got a couple of training camps coming up. The Tour of Britain begins in Scotland on September 11. The Olympic test event was a good day to pick the right breakaway for Tom Murray (Sigma Sport-Specialized). “It’s probably the biggest race you’re going to do, you’ve got one chance to go down the road,” Murray said. Escaping after 20 kilometres, he found himself up front with Cleberson Weber (Brazil), Kristian House (Rapha-Condor-Sharp) and his “best mate” and fellow Yorkshireman Liam Holohan (Team Raleigh). “It wasn’t in the plan, but we did have a bit of a smirk when we got together,” Murray. Spending a couple of hours in front, Murray was popped on a couple of small climbs after the last time up Box Hill. “I’m happy with my ride, I’m a bit disappointed I couldn’t hang out till Kristian and Liam got caught. I had a bad ten minute spell,” he said. House went on to take the King of the Mountains prize. The next day, Murray was back at work, but he’ll take some fond memories from Sunday’s escape. Fancy a challenge? Head down to the newly resurfaced Herne Hill velodrome for a special test event at the start of September and you’ll have the chance to get your name in lights. Home club VCL are running the open day on September 3, and as well as being among the first to try out the refurbished track, they are inviting riders to set new records for the flying 200m, kilo and pursuit. The meeting will follow the normal Open Season series format, with a wide range of categories and age group free to compete. 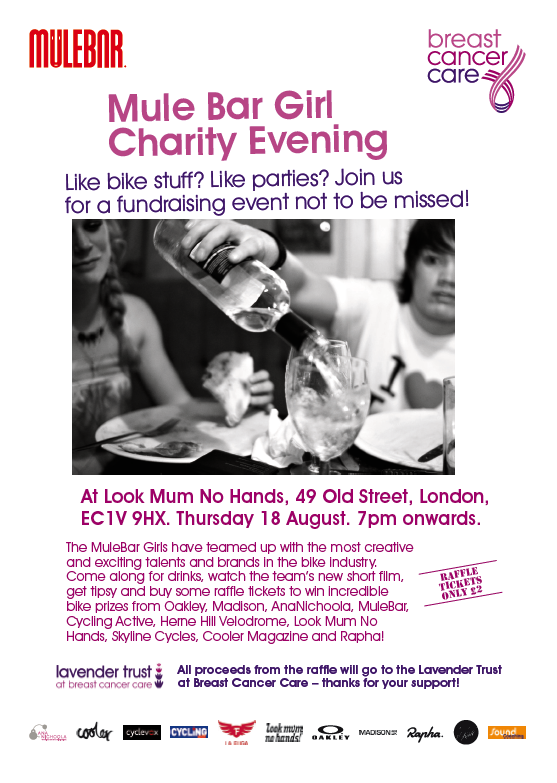 The Mule Bar Girl Race Team has teamed up with the most creative and exciting talents and brands in the bike industry to host a charity evening at London’s Look Mum No Hands tomorrow evening. The event is open to the public and the team welcome your support in raising money for the Lavender Trust at Breast Cancer Care from 7pm onwards at the cycling bar and café. The event will be presented by the familiar face and voice of pro cycling commentator Anthony McCrossan, who will be back in London again, after welcoming an international field to the Olympic Test event on Sunday. Free drinks will be available on arrival, with raffle tickets costing £2 for the chance to win prizes from Oakley, Rapha, Mongoose, La Fuga, Ananichoola, and many more, plus a coaching session from CW’s very own Symon Lewis is up for grabs! Rumour has it there may be a few recognisable faces in attendance so pop in if you’re in the area. The team explains the mission behind the Trust: “Young athletes feel indestructible. It’s an attitude that lets them challenge all limits. Young women are the same when it comes to health. So if you fancy a tipple for a good cause, head to Look Mum No Hands, 49 Old Street, London EC1V 9HX tomorrow night (August 18). Owners of some of the North West’s best coffee shops have organised a Leeds to Liverpool ride to highlight the area’s best drink stops for cyclists. The North West Coffee Tour will take place on September 17, and starts at Laynes Espresso in Leeds. Riders will also visit the Opposite Cafe in the Victorian Quarter, before they ride to North Tea Power in Manchester. After a stop-off at Coffee Fix in Gatley, cyclists will to head towards the finishing line, which is outside the Bold Street Coffee Shop in Liverpool, where a party awaits them. The owners of all the coffee shops are cycling enthusiasts, and are seeking to build a community which focuses on quality drinks and professional service. Thieves have once again targeted Reading’s Palmer Park Velo club, stealing five road bikes worth in excess of £3,000. Three silver-blue Specialized Dolce Sport and two red and white Giant OCR bikes were taken, and to make matters worse the club – which coaches children – had only just purchased them to replace equipment stolen in a previous break-in. The incident took place between August 8 and 13, and was only discovered at the start of a session last Saturday, which meant some children were without bikes to use. The club are asking anyone who may have information to contact Thames Valley Police (using the crime number EA3887054/11) or Chris Macleod via e-mail. Fans at the Reading DernyFest – which took place at the aforementioned Palmer Park – were treated to an exciting ending in the 25km final. Matt Gittings (AW Cycles.co.uk) was battling it out with Science In Sport’s Adam Duggleby when the back end of his bike began to feel awkward. Undeterred, he continued and with half a lap to go, him and his pacer Derek Marloe round Duggleby and Alex Wharton to take a fine win. Victory was made even sweeter when the problem became clear on the victory lap – a metal staple had pierced the tub. “I was determined to win ahead of the Derny National Championships at Welwyn next week,” Gittings said. The DernyFest was held in conjunction with a national women’s omnium series event, with Ireland’s Ciara Horn beating ODP talent Harriet Owen (Motorpoint) and Lydia Boylan. A memorial service for Derek Johnson will be held on Tuesday, August 23, at 12-noon, St Giles Parish Church of Wrexham, Wrexham, North Wales. Donations can be made to Nightingale House Hospice, Wrexham. Johnson, who died on August 3 aged 80, was three times Liverpool area TT champion and three times West Cheshire champion. More details in this week’s Cycling Weekly magazine.